I have a form that is working correctly. It allows the customer to upload files to my google drive. The question is, can I have the email I receive contain a link so I can just click on it to go to where the files are at? The answer is Yes. In the Notification Email, the upload field should be available which you can then add on the email message. When you add the Upload field on the email message, the link to the uploaded file will be available when the email message is open/read. to where all the files on the form are.. I see the links but it does a download of the file. You meant when you clicked on the link it downloads the file? The link you see is the location URL of the file. 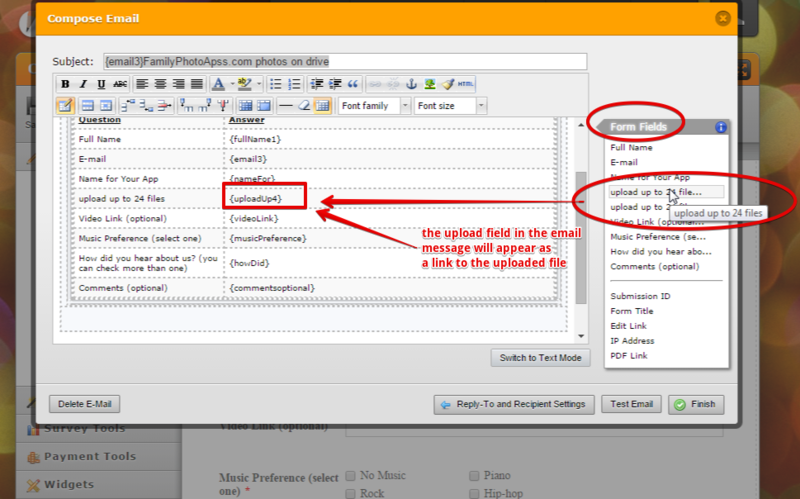 An example link to one of the uploaded file in your jotform http://www.jotform.us/form/43286964911161 submission email. On my end, when I clicked on the link, it opens on my browser. Okay I must be missing something.. could you give me the "dummy"
everything for free before I upgrade to a "real" account.. I think I understand what you mean. In the email notification the provided URLs for the submitted files are not from your google folder. They are from the uploaded files in your account. I was able to reproduce the issue on my account, therefore I am escalating this thread to our developers so they can take a look at it. Please allow some time for them to evaluate it and once an update comes up you'll be notified here. I want a link to the google subfolder where the files reside.. I want that link to show up in the email I get. The uploaded file link you see in the form email is coming from the JotForm server. If what you wanted is the link of uploaded file coming from your Google drive account subfolder, you will have to manually put it in the email message/notifier instead. Share or copy the link of the file in your Google drive folder, and the paste the link in the Notification Email message body. BUT please take note that this is not the same to using the JotForm upload field link that already resides in JotForm server. Because the jotform upload field file link is automatically included in the email, it will not be the same if you want to use the link of the file from your google drive. If you share the entire subfolder (not just one file) of your google drive where the uploaded files resides, anyone who read/open the email will be able to see all the files in the google drive shared folder. Hope this clarifies the matter. Please let us know if you need further assistance on this. but the customer does not see it on the form?